The domesticated Yorkshire blue and white pig origin is traced to the United Kingdom. Conservation status of the animal is regarded as extinct. Also known was ‘Blood Breed’ or Bilsdale blue the small pig was found in North Riding of Yorkshire. Yorkshire blue and white pig has prominent blue spots on the skin. The hardy Sows are regarded as excellent mothers and popular with small farmers in Yorkshire. 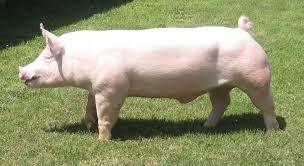 Bilsdale blue was progressively bred with white pigs and by 1973 became extinct. In 1954 only 3 were licensed and one in 1963. It featured in a 1952 British transport films and a documentary Farmer Moving South. Copyright © 2019 agricfarming. All rights reserved.